Blog Usahawan Tani - Pertanian Penternakan Perikanan: Tanaman Cashew Nut Secara Komersial Berpontensi Di Malaysia ? Tanaman Cashew Nut Secara Komersial Berpontensi Di Malaysia ? It grows up well in all soils. Red sandy loam is best suited. Plains as well as hill slopes upto 600 - 700 feet elevation are suitable. June – December is optimum for cultivation. About 200 plants/ha can be planted. Spacing of 5 x 4 m accommodating 500 plants per hectare is recommended prune the interlocking branches during the July-August to maintain the frame. Fertilizer application may be done during November - December in the East Coast areas. 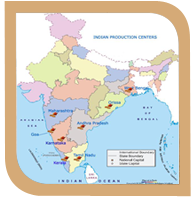 Wherever possible the fertilizer can be applied in 2 equal split doses during June-July and October-November periods under east coast area, a fertilizer schedule of 1000:125:250 g NPK/tree is recommended tree. Plough the interspaces after the receipt of rain and raise either groundnut or pulses or minor millets till the trees reach bearing age. Irrigation: Normally grown as a rainfed crop. Irrigation once in a west from flinching to fruit maturity stage is good to increase the yield. Develop the trunk to a height of 1 m by removing low lying branches. The dried twigs and branches should be removed every year. 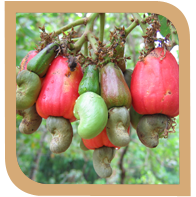 Old and senile cashew orchards with poor yielder are cut down leaving a stump of 1 – 3 m height from the ground level. 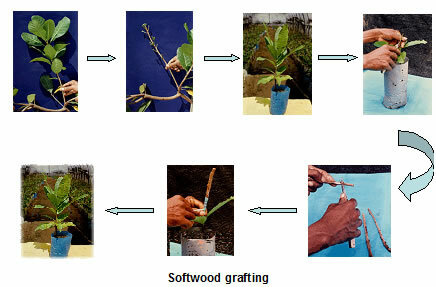 The emerging new sprouts are used as rootstock for epicotyl grafting. Suitable scions are collected and grafted on to the new sprouts. 2. Swabbing the bark of exposed roots and shoots with Carbaryl 50 WP 2 g/lit. Twice a year before the onset of South West Monsoon (March – April) and after cessation of monsoon (November) painting of coal tar + kerosene mixture (1:2) or swabbing with a suspension of Carbaryl 50 WP (4 g/lit) can be done up to one metre length in the exposed trunk region after shaving the bark or swab the tree trunk with neem oil 5% thrice during JanuaryFebruary, May-June, and September-October..
3. Root feeding with Monocrotophos 36 WSC 10 ml + 10 ml of water kept in a polythene bag on one side of the tree and keep the same amount on the other side of the tree (Total 20 ml/tree) divided into two equal halves will give protection when there is moderate incidence. 4. Remove grubs from early stage infested trees and drench the damage portion with Chlorpyriphos 0.2% @ 10 ml/lit or Neem Oil 5%. Spray application of phosalone 35 EC@ 2.0 ml, followed by carbaryl 50WP @ 2g/l and monocrotophos @ 2ml/l at vegetative flush stage, panicle initiation stage and nut formation stage respectively are recommended for the management of tea mosquito bug. Spray schedule involving three rounds of spray viz., first spraying with Profenophos (0.05%) at flushing stage, second spraying with Chlorpyriphos (0.05%) at flowering and third spraying with Carbaryl (0.1%) at fruit set stage is most effective. Shoot caterpillar can be controlled by spraying Profemophos 50 EC @ 2 ml/lit. 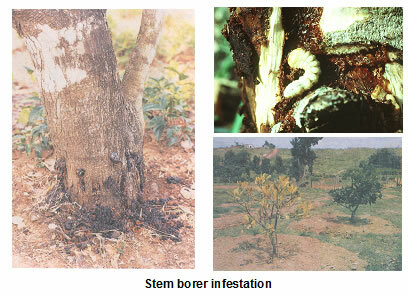 Root borer can be controlled by pouring Monocrotophos 10 ml/tree in the bore holes (Insecticide 5 ml + 5 ml water). Prune the affected shoots just below the affected portion and apply Bordeaux paste. Spray 1 % Bordeaux mixture or any copper fungicide like Blitox or Fytolan 0.25 % twice i.e. in May - June and again in October as a prophylactic measure. The plant starts yielding 3rd year onwards. The peak picking months are March and May. Good nuts are grey green, smooth and well filled. 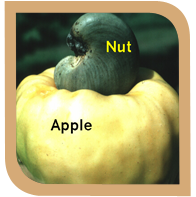 After picking, the nuts are separated from the apple and dried in the sun for two to three days to bring down the moisture content to 10 to 12 %. Properly dried nuts are packed in alkathene bags. This will keep for 6 months. 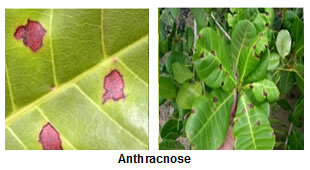 About 3 - 4 kg/tree/year can be obtained. KENAPA PERTANIAN DI THAILAND BERJAYA?